Belle enjoys reading. She is evidently a rarity in her tiny village, as many of the townspeople find her to be “odd.” “Odd” also applies to her eccentric father, an inventor on his way to a local competition. He makes a wrong turn, ends up in a scary forest and ultimately in chains in the basement cell of a legendary castle owned by an unhappy beast. Sound familiar? 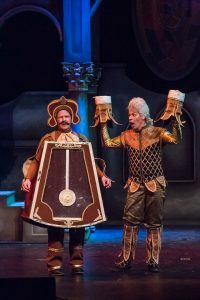 This is just for starters in Candlelight Dinner Playhouse’s current lavish holiday musical. 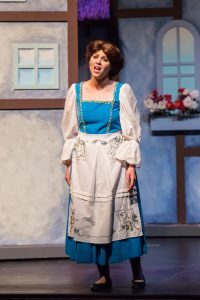 Katie Jackson is a winner as the charming Belle. She is understandably “the most beautiful girl in the village” and has a voice to match. The local bully and womanizer, Gaston, has decided he wants Belle as his wife. He is an egotistical dimwit, and Belle wants nothing to do with him. 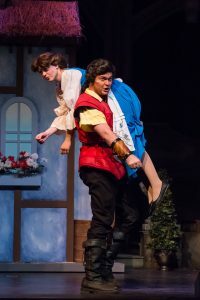 Eric Heine is in fine voice as Gaston, and becomes increasingly menacing as the show continues. The Broadway musical premiered in 1994, based on the incredibly popular 1991 Walt Disney movie. Disney’s movie had roots as a classic French fairytale. A cold-blooded prince was magically transformed into an ugly “beast” as punishment for his unwillingness to help a woman in need. The curse is transferred to the servants in the beast’s castle. They are slowly becoming household objects instead of human beings. There is Lumiere, the candelabra; Mrs. Potts, the teapot; Cogsworth, the standing clock; Chip the teacup son of Mrs. Potts; Madame Grand de la Bouche, the wardrobe cupboard; and Babette, the feather duster. Everyone is hopefully awaiting the time when the curse might be lifted. This will happen only when the beast falls in love with a beautiful girl, and she loves him in return. There is a deadline for the curse to be reversed: when the last petal falls from a rose kept under glass in the beast’s castle. The Candlelight production is remarkable. The sets, music, costumes, lighting, cast, and choreography are excellent. The music contains several well-known songs from the original movie. When the beast sang “If I Can’t Love Her” at the end of Act One, the audience erupted in enthusiastic appreciation. Another standout is when the inanimate household objects warmly welcoming Belle to the castle with “Be Out Guest.” Bob Hoppe is particularly good in this musical segment, playing Lumiere. 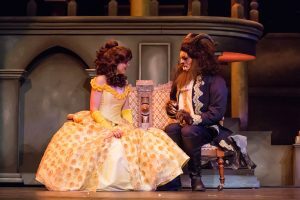 The beautiful melody, “Beauty and the Beast” is very well performed by Joanie Brosseau-Rubald as Mrs. Potts. 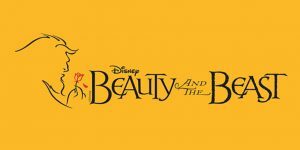 Supporting roles include Kent Sugg as Belle’s father, Samantha Jo Staggs as Madame de la Grande Bouche, Harmony Livingston as Babette, David L. Wygant as Cogsworth, and Ethan Knowles as Lefou. Brekken Wald and Christopher Walton alternate in the role of Chip. There are dozens of clever additions to the story. Some characters fly. One becomes a human chandelier rising above the stage. Chip glides in and out on roller-sneakers. The snarling wolves with flashing eyes are frightening. When I learned that Kalond Irlanda had been cast as The Beast,” I was apprehensive. I thought he was very good as the young Tommy in Candlelight’s recent production of “the Music Man.” He was then playing a teenager. What a transformation he has made in becoming the beast. Irlanda is excellent. His voice is powerful. He can be menacing. He can be kind. He rules the production. Direction and choreography are by Jessica Hindsley and Kate Vallee. Music director is Victor Walters, with Casey Kearns as scenic designer. Choreography is especially good, as are all the special effects. Technical Manager Shauna Johnson mentioned that the special effects for this production are among the most challenging ever staged by Candlelight staff and crews. The story and its outcome are so well known that the show does lag a little in the second act. It was as if “I know what is going to happen, just let it happen – instead of providing last-minute unnecessary intrigue.” The total production, however, is an evening of immense talent in a joyous production where everyone involved (on stage or off) is operating at full throttle.